The Greek drama is going to its end within next 30 – 50 days. 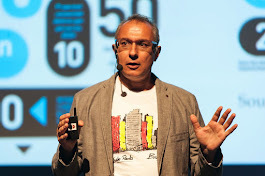 And as it is well known from the ancient Greek drama, no matter if the end will be a happy one, the major messages have already sent and their importance is global. Greeks themselves have done a lot of nasty things that resulted in today’s drama. An incapable political system, corruption, nepotism, a useless growth of public sector, tax evasion, and a spirit of “making money with the less or even no effort” have been some of the characteristics of our society for the last 10 years. But still, most of the society and especially the private sector work a lot, much more than the EU average. As for social benefits, the Greek welfare state simply never happened. A lot of infrastructure has been delivered using EU funds, but also a lot of money has been spent for “white elephants” that were used just for 15 days during Athens Olympic Games and now they are hanging around as symbols of an incapable state. And decades of billions are spent on a permanent basis for new weapons (aircrafts, submarines, armored vehicles etc.) in order to keep a high level of army readiness against the possibility of a war with Turkey. USA, Germany and France together control around 90% of the Greek army supplies. 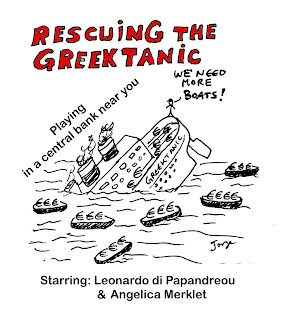 Even so, all the previous are not enough to explain the Greek tragedy today. The real problem is much more than a Greek one. Allow me to start with some stereotypes that create a lot of confusion. Those stereotypes are repeatedly used by international press, in some cases just due to ignorance and in other cases on purpose. Stereotype 1: Greece will collapse because it does not follow the rules that IMF and EU are insisting to be applied. I know a couple of other countries like Portugal and Ireland that are applying the rules with religious dedication and much more social consensus than Greece. But unfortunately they are very close to collapse too – needless to remind you that Ireland collapsed in 2008 just few months after a storm of articles that praised its competitive and open economy that was built as the rules said. And I can also add a lot of other European countries that are not so close to collapse but they are not so far too, independently of their compliance with IMF and EU rules. Let me put it in another way. Do we know any country around the world where the application of the rules proposed by IMF and EU for my country (25% reduction in private sector salaries, massive privatizations of everything that has value, collapse of the public utilities, and austerity until death etc.) has resulted in good results? I do not think so. Stereotype 2: Greek governments did not implement the specific measures IMF and EU have proposed and this is why the situation goes worst. In fact, what happened is rather the opposite. Greek governments said yes to everything that was proposed (as everyone knows there was no negotiation at all) and applied all major suggestions: they increased VAT from 11 to 23% (which killed the tourist sector), they cut salaries in public sector by 20%, the average private sector salary reduction is about 25%, they increased the direct and indirect taxes to unbelievable levels, they cut pensions from 20 to 50%! Of course the tax system was not reformed and privatizations were not promoted as IMF and EU wanted. But this was practically impossible with the public sector on strikes and the society in demonstrations. What was the result of the bold plan that EU and IMF suggested? An 18% unemployment rate and thousands of young people searching to migrate. Also, a 10% reduction of the National Gross Domestic Product. As a result, there is a substantial increase of current-account deficit and the debt as percentages of GDP. As ECONOMIST magazine wrote in its last issue (January 28th ) the proposed plan simply it is not working! Stereotype 3: I heard someone saying that German tax payers (and not only) have already paid a lot to support Greece. This is much more than a lie. It is an upside – down of the reality. In fact Greece has taken no money for free during last years from any European or other country. Greece borrows money with 5% interest from Germany and Germany borrows money with 0.5% from the markets. That’s really a good investment, right? Everything is clearly written in thousands of papers in Internet. Event the European Task Force that has arrived to Athens in order to support Greek reforms is not working for free. Recently, an officer from Brussels informed me that France and Germany will be paid by EU in order to provide their technical support. Stereotype 4: It is a debt crisis not a crisis of Euro. This is the favorite of Merkel. Unfortunately, she is one of the very few that understand it that way. Still Germany has all the power to create a media campaign to promote its position, but the reality doesn’t change. Greek debt is just the cherry upon the pie. The pie is Euro problems: lack of EU-wide tools for common fiscal policies, absence of any coordinating mechanism related to tax issues, myopic competitiveness management by Germans and most of all a completely incapable political leadership for the last 10 years. All those have transformed Euro from the most ambitious experiment in Europe to the worst nightmare. Well, the truth is that Greece is the weakest link of a very weak European chain. And no matter what will be the future of Greece, inside or outside the Euro Zone, the weakness of EU will not change. EU goes like the Titanic towards the iceberg, although the iceberg was visible for more than 3 years now. But the captain (in this case Germany) shouts that it will leave the boat first unless everyone on board agree and obey to its demands. This is a no way - out situation. We do not know if there is still time to save the boat, even if we all agree to captain’s rude orders. And the captain knows well (I hope) that out of the boat it has no chance to survive in the global ocean. Greeks must work hardly to change their own society and make it more competitive and productive. They have to make it business – attractive in order to fight unemployment. They have to transform their political and administrative system; they have to clear out corruption and nepotism; they have to create a fare tax system. They also have to keep education and health-care services alive and provide a minimum social support to the poorer part of the society. 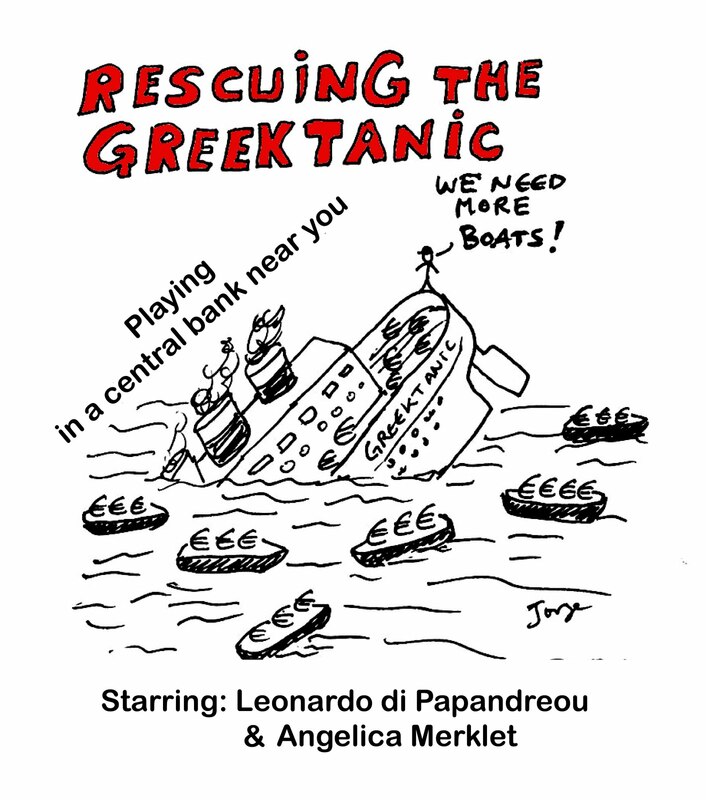 Greek Rescue: are you kidding? Asbestos: A verdict with worldwide consequences!